You are here: REDWOLF > Home > News >News Detail - M-33 Claymore Mine IN STOCK now!! 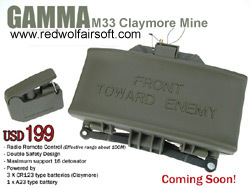 GAMMA releases their latest airsoft product - M-33 Claymore Mine with Wireless Remote Control. This long awaited product will be released in the coming 2 weeks but initial quantities will be limited so pre-order yours now! USD199, Click here to get one now. Based on a similar trampoline system found in earlier airsoft claymores, this GAMMA model is injection molded with a completely different trigger system. Whereas previous claymore mines has their spring action held down by the top cover (which caused immense durability problems and often caused the claymore to fail after several uses), this GAMMA model has an independent trigger system that does not cause unnecessary stress on the front cover. Even more impressive is the use of a custom designed micro-circuitry that allows the entire wireless receiver unit to fit inside the mine unit without the need to carry along a bulky external radio receiver device. What you see in the photo is what you get - a compact and powerful wireless package! The wireless detonation device has a 100 meter (330 feet) range - and best of all, you can set up 16 different remotes (additional remotes sold separately) to activate one mine, or set up one remote to activate an unlimited number of mines all at once. That means that each person on your 10 man team can carry a detonation trigger, and any one person can wirelessly detonate a single mine. For ambush scenarios, you can place say 10 mines in strategic positions, and any one of your 10 man team can detonate all 10 mines at once with a single push of his wireless detonation device! No other airsoft mine boasts this kind of flexibility and range! While this mine packs approximately 400 BB's for a powerful wallop, you can also pack in baking powder or baby powder for realistic smoke effect on detonation. Our in-office tests showed that this mine is capable of throwing 2 teaspoons of baby powder up in the air about 1 storey high and creating a huge smoke effect! Constructed in durable ABS plastic with steel adjustable legs. Works on 3 CR123a batteries (included) and an A23 battery for the remote (also included). English instruction manual included! Click here to get one now.